On the fertile alluvial banks of the river Indus, in Northwestern India, in the 3rd Millennium B.C. a splendid civilization arose. As peers of the Babylonians, the city dwellers of Mohenjo-Daro and Harappa used baked clay to build their houses and they constructed grids of paved roads as well as water supply and sewage systems. And, from the artifacts recovered from these towns, they seemed to have formed the rudiments of Hinduism. Although subdued by superior military technology and eventually displaced to the South by invading “Aryans”, their Hindu traditions survived and flourished. What happened in the next two Millennia constitute the heart and soul of India. Through two Epics, the Ramayana and the Mahabharata as well as through the Vedas and Puranas, the essence of Indian Culture was founded. Indian Philosophy reached greater heights through the exquisite abstract thoughts expressed in over 200 volumes of Upanishads. Embedded in Mahabharata was the most sacred Hindu Scripture, the Bhagavad-Gita and this would lay the foundation for the Hindu laws and become the backbone of the Indian society. Then, 500 years before Christ, an upheaval in Indian thought and philosophy would culminate in the founding of two more religions. Of these, Buddhism would spread far and wide in Asia but Jainism, with its ascetic codes remained confined to India. The teachings of the Hindu sages, as well as those of the Buddha and Mahavira, have helped India retain its unique quality over the Millennia. Hindu belief in all living creatures as possessing a fraction of the Supreme Soul and thus worthy of worship, is embodied in the traditional Indian greeting, “Namaste”. The word literally means “I bow to the divine in you” and is accompanied by a gentle bowing of the head. Respect for elders and teachers is deeply ingrained in Indian Culture and is an essential “glue” that kept Indian society intact over the ages. Younger Indians stand up when approached by a teacher or elder and they address every older person (even though not related) with an adjective added to the elder’s name to indicate either the seniority or age. This is the best good luck”. The strength of any culture can be measured by its resilience and endurance. The Indian civilization had witnessed many invasions. First were the Persians and the Greeks. Then came the Afghans and the Mughals. The Muslim hoardes from the west made a habit of destroying the Hindu, Buddhist and Jain temples and traditions. Nalanda, (the world’s first live-in university, attracted students and scholars from all over Asia and housed up to 10,000 students and 1,500 teachers, in its heyday), was gutted by the invaders. 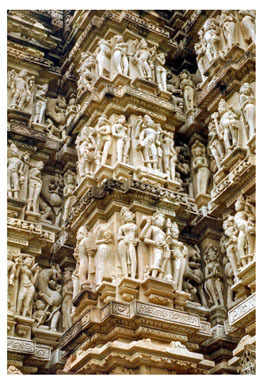 Destroyed were also most of the 85 exquisite temples of Khajuraho, in the present day state of Madhya Pradesh. The 22 remaining temples are masterpieces of architecture; these temples would, in fact, qualify as sculptures rather than as architectural structures. The greatest test of endurance was the long colonial rule, particularly under the British; Indian culture emerged from even this onslaught, relatively untouched. In her turn, India absorbed and enriched its own culture from the invading forces. A classic example is the cultural exchange that occurred during the Mughal period. The Indian architecture changed, but it also influenced the Persian architecture. The same can be said of the cuisine; the Persian style of cooking left an enduring impact on the indigenous cuisine. The combined product is so highly developed that wherever Indians went, their cuisine left an indelible impression. Examples are Malaysia, Singapore, most African countries and the Caribbean nations. A spectacular case of Indian cuisine’s influence is the sway it now has on the British Isles. How else can one characterize the fact that the British have adopted “curry” as their national dish?! The highly developed Indian classical music was also enriched by the Persian and other influences. It is important to note, however, that through all these cultural admixtures, India did retain its own unique flavor. The Indian classical dances such as the Bharata Natyam play important roles in giving India continuity of its culture from antiquity. While uniquely Indian and exquisite in their execution, these dance routines narrate stories from the Hindu epics. Poetry and literature were always a strength of India. The epic Mahabharata was written centuries before Homer’s Iliad and Odyssey and is at least eight times in volume of the two combined. This literary tradition culminated in the works of our Nobel Laureate, Rabindranath Tagore. 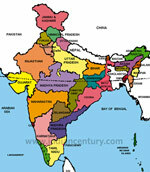 Indian writers are now at the threshold of becoming major forces on the world scene. Writing in English, the Indian and expatriate writers regularly win International awards. Other major exports from India in the cultural scene are Yoga and Meditation; their impact is now being felt all over the West. Ayurveda, the Indian medicine is gaining some acceptance as an alternative medicine in this country. The age-old Indian tradition of ahimsa (non-violence) and the observance of dharma (one’s duty or righteousness) would come to the aid of a long-suffering India, in the 20th century. It is also a classic case of victory of good over evil and, considering the teachings of all the major religions that sprang from India, true to the Indian persona. Mahatma Gandhi harnessed the Indian sensibilities and, armed with only the moral superiority and strength of conviction, he brought the mighty British Empire to its knees. This would open the flood-gates of liberty for most of the colonies soon thereafter. More significantly, Gandhi’s non-violent methods would prove fruitful in the struggle against oppression of all flavors, in many parts of the world. Notable of the “children of Gandhi”, who successfully used his tactics were, Martin Luther King in his civil rights struggle, Nelson Mandela in fighting apartheid in South Africa and Lech Walessa in defeating the communists in Poland. Thus, all these freedom struggles were exported ideas, borrowed and fine-tuned by Gandhi from India’s deep religious past. Now, a word about the success India is having in the field of information technology; this is by no accident. The Indian system of free primary and secondary education, as well as higher education, has unleashed the traditional Indian strength in literature, philosophy and mathematics. This policy of free education was a product of the vision of India’s first Prime Minister, Pundit Jawaharlal Nehru. This may be an appropriate time to pay tribute to another man who, I think was, and is, head and shoulders above every one else in the field of mathematics and astronomy, from any age! In this particular area of Indian Culture, he has no peer and it gives me great pleasure in bringing to light his accomplishments and thus, a measure of recognition to this (forgotten) great Indian genius. Aryabhata I (AD 476-550) was the first to calculate the exact value to the 4th decimal point of “pi”. He was also the inventor of the concept of zero and of the so-called “Arabic numeral system” and he described large numbers up to 1018. In the field of astronomy, Aryabhata calculated accurately the circumference of the earth. He correctly deduced that the planets shone due to reflected light from the sun and that eclipses occured due to the shadows of moon and the earth. He, and not Johannes Kepler (AD 1571), first described the elliptical nature of the orbits of the planets. When he suggested that the earth rotated on its axis and this gave the illusion of apparent rotation of the heavens, he dispelled the notion of “flat earth” as well as the popular belief that earth was at the center of the universe. In conclusion, I have examined the various facets of Indian culture through history, but I have to end this essay with an inescapable trepidation that is in the minds of India observers now…after having survived the numerous onslaughts in her long history, will she withstand the new and more insidious influences from the West, especially from America? Will punk and rap “music” and the undesirable inflows from the internet erode Indian society? If one equates palpable changes in the Bollywood movies, from the innocent dance routines of the past that were true to many styles of classical Indian dances, to flagrant adaptation of Michael Jackson’s repertoire, to a slippery slope, one could justifiably feel depressed. Even the music has absorbed more instruments and styles from the West and sounds distinctly foreign. The dress codes in India have changed as well. Will the respect for the elders and (hitherto) unwritten understanding that care of our parents is our responsibility, be next? Will the burgeoning well-to-do middle class “pursue happiness” as much as the Americans, to the detriment of the community? Well, all these, only time will tell. My prayer is that the 5,000 years of culture will guide future generations of India through these muddy waters as well!